Wie alle Grupp en, die in Brandenburg mit Geflüchteten arbeiten, freuen wir uns über den neuen Erlass des Landes Brandenburg zu Personen, die Opfer von rassistische motivierten Gewalttaten wurden und abschiebebedroht sind.¹ Es ist ein erster Schritt, denen ein Bleiberecht zu geben, die von Nazis attackiert wurden und dies beweisen können; die schwer verletzt wurden und die aufgrund niemals wieder voll genesen werden. Aber was ist mit den anderen? Rassismus auf der Straße, Beleidigungen und Einschüchterungen von Neonazis sind weiterhin tägliche Erlebnisse von Geflüchteten. In einem Fall bedrohte ein Mann zwei Frauen aus Henningsdorf in einem Supermarkt, indem er mit einer Schreckschusspistole auf sie zielte. Solche Vorfälle zu beweisen bedeutet einen komplizierten Prozess, der weiteren Stress und Traumata bei den Betroffenen auslöst und sie zwingt, die traumatischen Erlebnisse noch einmal zu durchleben. Weiterhin erleben viele Flüchtlingsfrauen, die in Lagern erleben täglich physische und sexualisierte Gewalt, sowohl innerhalb also auch außerhalb des Lagers.Hinzu kommt die psychische Gewalt des Lebens unter beengten, unhygienischen Umständen in geschlechtergemischten Unterkünften, bewacht von meist männlichem Sicherheitspersonal, die jede Bewegung kontrollieren.. Einen weiteren Ausgangspunkt von sowohl psychischer als auch physischer Gewalt stellt die neue Angst vor unangekündigten Abschiebungen dar – meist in der mitten in der Nacht.Diese Gewalttaten werden vom deutschen Staat selbt verübt, der sein Unterdruckungssystem durch brutale Polizeigewalt durchsetzt. In aktuellen Fällen erzwungener Abschiebeversuche in Hennigsdorf und Cottbus wurden Frauen ernsthaft verletzt und wurden traumatisiert. Wir glauben nicht daran, dass der Staat warten sollte, bis Geflüchtete für ihr Leben lang beschädigt oder (re)traumatisiert sind, bevor ihnen ein Bleiberecht zusteht! Entschädigung für alle Opfer rassistischer Gewalt! Lasst uns auf allen Ebenen gegen Rassismus kämpfen! Like all the groups in Brandenburg working with refugees, we are happy to welcome the new decree of the state of Brandenburg on persons who are victims of racially motivated violence and are subject to deportations.¹ It is a first step to grant a right of residence to persons who were attacked by Nazis and who were able to prove it; who were seriously injured and will never fully recover from that attack. But what about the others? Street racism, abuse and threats from neo-Nazis are still a daily occurrence for refugees. In one case, two women from Hennigsdorf were threatened by a man pointing a gun at them in a supermarket. But to prove such assaults is a complicated process that causes further stress and trauma to the victims who are forced to relive their traumatic experiences. Furthermore, many refugee women living in lagers experience physical and sexualized violence every day, both from inside and outside the lagers. Added to this is the psychological violence of living in crowded, unsanitary conditions, in mixed gender camps, guarded by male security staff who control their movements. Another source of both psychological and physical violence is the new threat of unannounced deportations, often in the dead of night. These violences are perpetrated by the German state itself, which reenforces its system of oppression with police brutality. In recent cases of forced deportation in Hennigsdorf and Cottbus, women suffered severe injuries and ended up traumatized. We do not believe the state should wait until refugees are maimed or (re)traumatized before they are granted the right to stay! 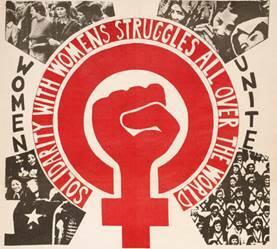 Women in Exile and International Women’s Space have assisted refugee women who have beenattacked outside and inside the lagers. Some of these cases have been reported to the police. Violence against women is violence, whether it is coming from fellow refugees, the police or neo-Nazis. Compensation for all victims of racist violence! Fight racism on all levels! December 16 on Friday, between 11 a.m. – 12 a.m. we will be live on air in F Radio on 88,4 Mhz in Berlin + 90,7 Mhz in Potsdam and on www.piradio.de to talk about the book just before the book launch. We send solidarity greetings to our sisters and brothers on the protest march from Munich to Nürnberg! It feels so good and inspiring to see the videos of this strong, angry and energetic protest! This is a clear reaction to the racist asylum laws which are passed here in Berlin and effect so many refugees all over Germany and even all over Europe. Laws which practically abolish the right of asylum for a huge number of people. Laws which abolish the right of privacy and dignity, by reintroducing food packages, Residenzpflicht, mass-accommodation etc. pp. Laws which try to divide minorities, an old colonial strategy, by categorizing refugees into „good victims“ and „bad criminals“. Laws which criminalize „arabic men“ as rapists, abusing feminist demands and struggles for a racist agenda. Deals and treaties with dictatorships all over the world to be able to „control migration“. Fences and walls which are build everywhere with the support european taxes. Laws and treaties which lead to the highest numbers of death in the mediterranean sea this year. This is a clear reaction and resistance to the right wing propaganda of AFD, Pegida, Identitäre Bewegung and many more. A propaganda which leads to increasing numbers of racist attacks on individuals, organizations and refugee accommodations. We ask ourselves, how it comes that attacks by foreigners are easily categorized as terrorist actions, where else systematically organized racist attacks on refugee accommodations are not? We hear the stories from our sisters in the refugee-accomdations in Berlin and Brandenburg and we have seen all sorts of violence against refugee women committed in Germany. Women suffering from acute forms of depression and heavily medicated; women who tried suicide; women who became alcoholics; women who suffered and continue suffering from sexist and racist attacks in the streets, by having their houses burnt by right extremists groups, by racist and sexual abusive security personnel in the Heim where they live; women being humiliated in the Ausländerbehörder, women being threatened with deportation and it’s violent agents. But as an answer to the violence and oppression we hear stories of resistance, we are resisting and won’t keep silent..!!! Women, who are breaking the isolation and silence by giving testimonies about their situations and bringing them into the public. A woman, which resisted her own deportation twice, facing strong police brutality. A strong demonstration, in the beginning of this year, organized by women in Hennigsdorf after two women have been attacked by an armed Nazi in the public. A protest bus tour organized by Women in Exile going through Germany. The Roma-protest in Berlin and Regensburg, which a lot of women joined with their forces and voices. Various forms of resistance by women in accommodations just by coming together, chairing their stories and creating solidarity..
We need a new feminist approach to the struggles! One that includes the refugee women and their stories of resistance and survival against patriarchy in whichever form it appears, wherever it’s been implemented against women. We need to be thoughtful and practical. We need to have more feminist groups ready to engage politically in the fight against racism, we need to fight a system that forces women to get pregnant or married in order to stay in Germany, we need to fight sexism not only when news come reporting about a group of refugee men attacking german women! 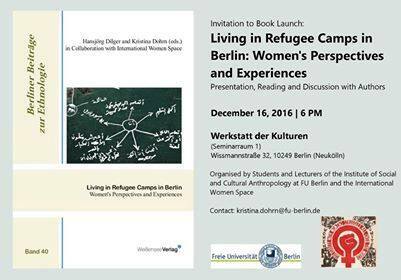 As Angela Davis told us on her visit to Berlin in 2015: “The refugee movement is the movement of the 21st Century. It is the movement that is calling for the rights of all”. Let us all join together in this movement and continue to create structures of resistance against all forms of oppression! Wearebornfree! Empowerment Radio #6 Women* Space is Everywhere! 3 months ago refugee and migrant women* occupied the main stage of the International Refugee Conference in Hamburg. We talked about the motivation behind this political intervention and its consequences. What is refugee women’s* role in the movement and how can we build links between feminist and refugee activism? We explored these and other topics on a wonderful Sunday evening with our guests Bahar from Kanal, Jennifer Kamau and Lea Höppner from IWS, La Toya Manly-Spain, Mai Shutta, Rajaa, Zari Harat & our live-audience. and Amdi prepared the food. The evening was hosted and moderated by the team of Wearebornfree! Empowerment Radio. Jennifer Kamau and Lea Höppner are activists from International Women Space. 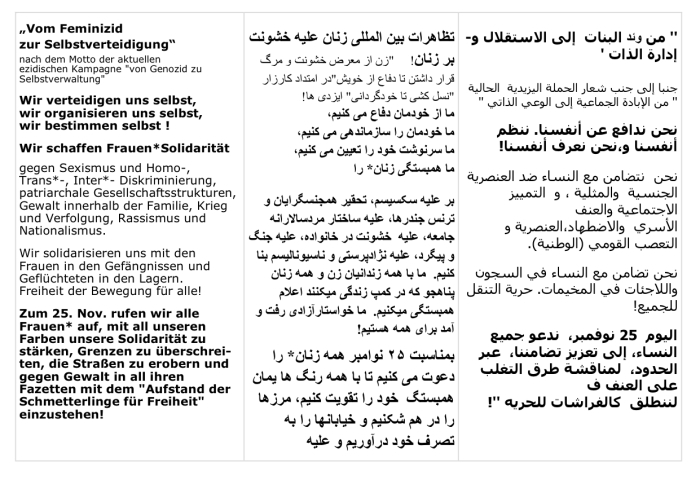 IWS is a group of migrant and refugee women* which came to Germany from former colonized countries as well as women* without that experience coming together to build a base and a common struggle against the effects of Fortress Europe. Mai Shutta is a computer engineer and activist from Sudan. Cofounder of the nonviolent youth mouvement Grifna, human rights defender, digital security trainer, nonviolence trainer and project coordinator with Kurve Wustrow. Working with refugees since 2011 and also consultant of several other organizations. Founder of FGM, Female Genital Mutilation Awarness Group. Zari Harat is an artist concerned with gender, queer, women’s* rights; a spiritual. political, human and ecological activist navigating her ideas in a neo- and postcolonial world. She promotes class and anti-colonial struggles for the right to stay (Bleiberecht). She is currently exhibiting her artwork “UR-SEIN” in Hamburg, in order to create a saner world with images. She has been living in Hamburg since 2010 and has spent many years in Berlin.